Google’s search engine results page (SERP) continues to evolve on a daily basis, incorporating new cutting-edge search technologies that are improving the search experience for users and creating new SEO standards for brands. 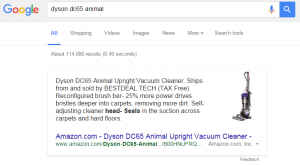 SERP’s latest innovation is a rich featured snippet known as the Google Answer Box. The Answer Box snippet has gained traction more recently over the course of the last year. According to an internal analysis at iQuanti across multiple enterprise SEO organic footprints in multiple industries, there has been 4-6x growth in keyword terms now triggering an Answer Box result. It’s well known that Google tries to interpret search intent based on selected keywords and associated user behavior models. Within this model, the search engine attempts to surface a relevant result and display it within the SERP as a highlighted boxed result – known as the Answer Box. Now, Google is known to test new features, innovations and algorithmic updates on a regular basis, but is the Answer Box here to stay? As of today, all signs point to yes, the most significant of which is Google’s recently filed patent for the Answer Box’s intellectual property. 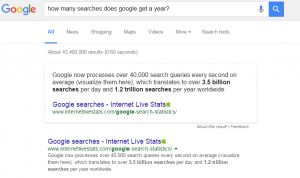 Why is Google Answer Box important for SEO? First, we should ask: why is any organic rank position important? Rank positions attract search clicks known as “click throughs,” which, when measured over the number of impressions yielded by a search result, provide a click through rate (CTR) – the primary indicator for how well your keywords have been optimized. A higher search ranking is likely to yield a higher CTR, increasing traffic to your website over time. 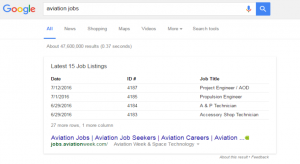 Google’s Answer Box sits above all other rank positions and is now coined as “Rank 0”. iQuanti’s data analysis reveals that, on average, Google’s Answer Box secures an astounding 32.3% CTR. This means that for the given term(s) triggered within your organic footprint, you are either securing 32.3% market share of that volume, or losing it – making it a significant opportunity for a brand’s SEO strategy. Is Rank 1 Still Rank 1 with Google Answer Box Present? The short answer is no. Based on several data points across several keyword sets and vertical markets, our team at iQuanti has concluded that without an Answer Box present, organic rank 1 position yields, on average, about a 25% CTR. However, what are the effects on the same exact keyword when An answer Box is present? iQuanti data shows that, on average, when an Answer Box is present the average CTR for the same keyword in the same number 1 rank yields a CTR of only 18%. 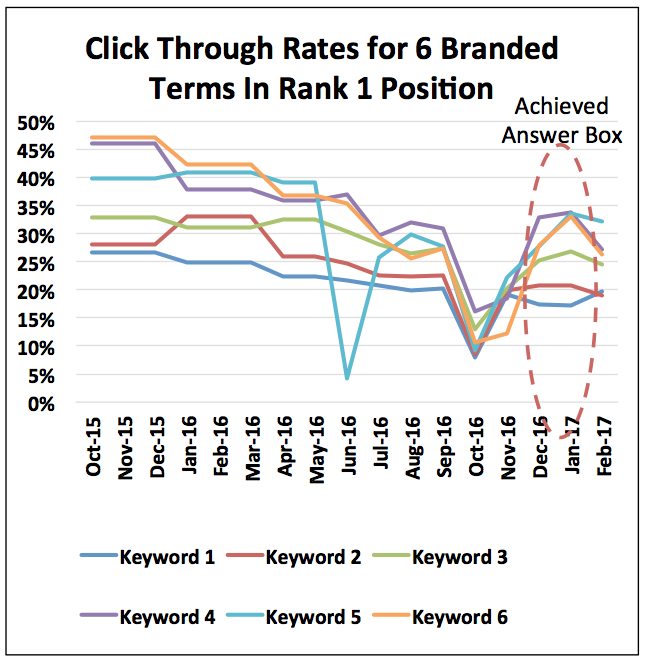 In the chart below, we can see that without any loss of rank position (maintaining rank 1), CTR for the six keyword examples declines rapidly when an Answer Box result surfaces into the equation, but is not achieved. Then, once the Answer Box is achieved, the CTR climbs back up, surpassing the organic rank 1 position to the upper echelon of 30-35%. This behavior is represented both in branded and non -keyword sets within the SERP. It shouldn’t t take much convincing as to how important and impactful this rich featured snippet within Google’s glorious landscape is. But how does a brand even start developing a sound strategy that can achieve the desired performance? This is a complex, multi-layered question, but it can be answered in a simplified way. Here, I provide a detailed look at how brands can develop a comprehensive, long-standing a Answer Box strategy. First, you must identify which keywords are triggering an Answer Box. To do this, you must establish the organic footprint of your brand’s domain – which includes every organic keyword you’re ranking for, regardless of rank position. From there, you then must use a tool (like SemRush or iQuanti’s ALPs SEO Platform) to determine which keywords are triggering a featured snippet. For those that are particularly curious, you can map these data points out over the last year to see how your own organic footprint has grown within the Answer Box landscape. Conducting this in-depth analysis may just help to unlock some answers for why you may have experienced traffic loss for specific keywords.y. After segmenting out the data for your own footprint, it’s recommended to conduct similar research for your competition. Since much of this keyword information is publicly accessible through standard search, there should be no fear of conducting any malicious activity. Once competitive keyword research is complete,overlay the data over your own in order to understand the competitive landscape. Then, run a gap analysis to see which keywords within the competitive footprint are triggering the Answer Box that you have not targeted. This data will be saved for quadrant 4 of the Answer Box prioritization matrix. The second step is to prioritize and categorize all of this data within a simple 2x2 matrix. We should also remember here that in order to be considered for Google’s Answer Box search results, you must yield the proper authority and relevance. So, for the first quadrant let’s look at all the keywords that currently rank in a top 5 organic search position (and remember, authority is needed to win a result). This means that the web page in-market for those keywords already have adequate authority signals. 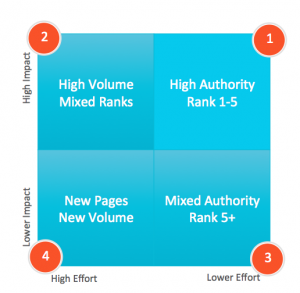 The second quadrant contains the keywords filtered by highest volume and mixed authority (in this case, the largest impact to traffic based on volume). This means that if you acquire an Answer Box result for high volume keyword terms, then these keywords will drive the most traffic to your website. With mixed authority signals, however, you may need to work on building authority to those pages. In the third quadrant are the keyword terms that have authority signals from rank 5+ (or, first page keyword terms and mixed volume). In this quadrant, you will need to try to boost rank and relevance to yield meaningful ROI. In the final quadrant we find keyword triggers from your competitive landscape previously referenced above (new pages, new volume). These are keywords that are currently unsupported by content, and where you therefore lack ranking. In this quadrant, there is new opportunity and new volume. Having all of the Answer Box keyword triggers consolidated into a list is really just the first step. Now we need to determine how and why these keywords are being triggered by Google. As I previously mentioned, Google is trying to interpret intent and to develop a true understanding of what you’re searching for as a user. So, if the Answer Box is yielding an answer (which it will be! ), you must then determine what the question is! This, of course, is a like a game of Jeopardy. You will need to try to understand what question(s) Google is trying to answer, and then make sure your website is answering them in a clear and concise way that utilizes the necessary keywords. According to Google’s patent,the Answer Box algorithm is calculating “answer elements” and providing an accumulative score. To translate this into simple terms…if website A answers the mystery question with a paragraph of text and a direct answer, it receives a score. If website B also answers the same question with paragraph text, but includes expanded elements (e.g. tables, charts, graphs, etc), website B will have then answered the question with more answer elements, thus achieving a higher answer element score. Additionally, if website B expands and answers “halo” (surrounding or supplementing questions) questions, then it is not only providing more answer elements but also deliver a stronger user experience, helping it achieve Answer Box status. In short, if it’s good for the user, it’s good for Google. How does authority or rank play a role in this process? Can only rank 1 achieve an answer box? Again, the answer is no. 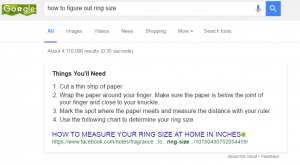 Personally, I have seen rank 5s still acquire the answer box within Google’s SERP. But, like any effective SEO strategy, both authority signals and relevancy combine to make up the winning answer. So, in effect, you will need to have enough topical authority to render your relevant content authoritative. Now, that being said, it doesn’t look like you have to be ranked number one to secure the Answer Box result (although it’s highly encouraged, of course).